Right To Ride reports that EVSC (Electronic Vehicle Speed Control) is back with a vengeance through the re-introduction of the Intelligent Speed Adaptation (ISA) – or – speed control system in a European Union (EU) Commission funded project called “Saferider”. Over several years speed control systems have been proposed to control the throttle on the motorcycle by removing the ability of the rider to accelerate when the motorcycle reaches determined speeds. 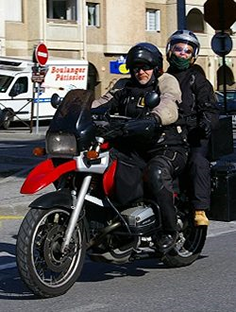 The EU funded Saferider project is moving system control technology forward with, Advanced Rider Assistance Systems (ARAS) being developed for motorcycles in order to warn the rider of a potential crash or collision in a number of scenarios, including a variation of the Intelligent Speed Adaptation (ISA) – or – speed control system. 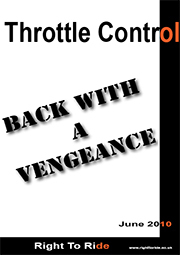 Force feedback in throttle: A throttle with programmable return force is being developed. 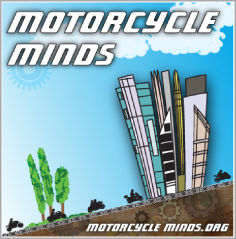 “In the project the motorcycle will be equipped with a force controlled throttle able to tune the return force through a servo controlled electric motor in order to communicate a speed reduction warning”. The authors also state that “imminent warnings cannot be turned off by the rider. This is due to the fact that imminent warnings only occur in cases that lead to great danger for the riders’ safety (2008:61). In spite of consultation at the beginning of the project with expert trainers who stated that ALL systems must have an on/off switch and that the warning systems being developed must not de-stabilize the bike or distract the rider, it appears that the trainers’ advice was dismissed or ignored. If the project consortium gets acceptance for the throttle control system – by default – because there is nobody to protest and nobody to challenge them, then what will stop the proposal of compulsory throttle control in the not too distant future? Right To Ride’s Trevor Baird, when with MAG in 2007, had the opportunity to ride a motorcycle fitted with throttle control.